Firefox take 90%> is CPU usage when I open File Open Dialog for uploading. I guess this may b Infinite Loop, just like Local DOS Attack. and when I google search many people shouting for similar things. Some says, its Google Killer. No way! Its just a Monkey, that understand English and Math. 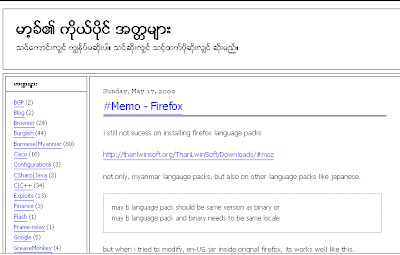 not only, myanmar langauge packs, but also on other language packs like japanese. but when i tried to modify, en-US.jar inside orignal firefox, its works well like this. 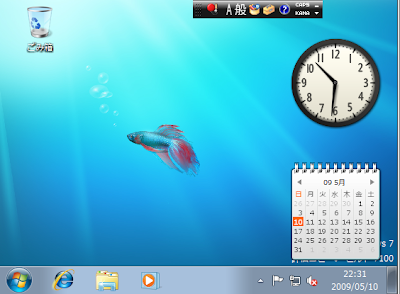 Installed Windows7 RC2 JP in VirtualBox inside Ubuntu. Not that slow, but Don't find any interesting things. So I write the codes not to be Perfect, and left lots of Bugs. #Just Joke, I am Not really left bugs intentionally. Its just like SCIM, but seems key combinations are not compatible with SCIM. and Seems in Fedora 11, iBus will be default instead of SCIM. Perfect Guide for Sql Injection or Prevention with Step by Step Approach + Theories. Seems H1N1 in Japan Already, but not yet confirm finally.